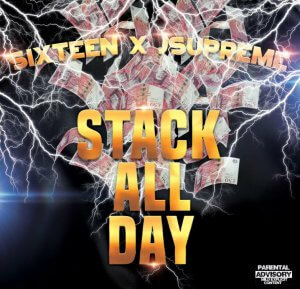 Hail­ing from Birm­ing­ham, UK, rap duo Six­teen and JSu­preme are set to release their latest single titled Stack all Day. The track is set to be avail­able on all major digit­al plat­forms from the 18th Janu­ary. Six­teen and JSu­preme is made up of 2 broth­ers heav­ily inspired by the ever-grow­ing rap scene in the UK. At just 16 and 17, the release of Stack All Day comes as one of their first, burst­ing with pas­sion and power in every line. Hav­ing been brought up in the Church, the pair aim to make their music a fresh­er, clean­er take on the gen­re. Stack All Day boasts clev­er melodic hooks and a boun­cy bass­line to sup­port their tal­en­ted rap lyr­ics. Des­pite their young age, Six­teen and JSu­preme achieve qual­ity pro­duc­tion from their bed­room stu­dio. The beat pro­duc­tion comes from Six­teen, an A* stu­dent study­ing music who hopes to put his tal­ent into major pro­duc­tion in later years. The release of the first track ‘Stack all Day’ by the brothers Six­teen and JSu­preme is out now!